Last week I wrote about Nick Morgan’s new book Can You Hear Me? How to Connect with People in a Virtual World. Nick has been studying the problems we humans have with virtual communications for the past several years and he writes about ways to break through and communicate well in his new book from Harvard Business Review Press releasing today Can You Hear Me? How to Connect with People in a Virtual World. As I was reading Nick's book, I kept thinking about Webinars and what we can do to make them way better. I speak on virtual presentations several times a month using Webinar software like Zoom, On24, Webex, and the like. I’ve been experimenting with how to make these events way more interesting for my audience. Here are a few of my own ideas and a few adapted from the Webinar chapter in Nick’s new book. The main thing is to make your webinar INTERESTING! 1) Use the video feature of Webinar software when it is available. 2) If you do use video, get a good external Webcam and place it where you are looking directly at it when you speak. I use a Logitech BRIO Ultra HD Webcam. 3) Stand up when you present(!) I use a standup desk for proper position of the camera. 4) Use a remote clicker to advance your slides so you aren't constantly fumbling for the advance button on your computer.. I use the SMK-Link RemotePoint Global Presenter. 5) Use a microphone that allows you to move around so that your head is not always in the same place. Motion on the webcam is good. I use a Sennheiser OfficeRunner wireless headset. 6) Amp up your emotion to “10”. I make a point to vary my voice a lot, and to exaggerate laughter and other actions. 7) Use gestures frequently. Don’t just be a talking head. Use your arms and hands (and legs) to communicate. (I've been known to drop to the floor and do pushups in webinars). 8) Many people push back when I say to present an average of 3 slides per minute. Common wisdom says only about 20 slides for a 40 minute webinar. Nonsense. Varying the visuals is essential. My slides have very few words - most are just images. Going bang-bang-bang through 100 slides in a half hour keeps people interested. 9) Aim for 30-minute presentation followed by 15 minutes of Q&A. Try to avoid going over 45 minutes total. People want to get in and get out in under an hour. 10) Use Twitter as a back channel for people to communicate during the webinar. Publish your Twitter ID and a Webinar #hashtag on the bottom of every slide and encourage people to participate.Send an auto tweet or two during the webinar and using the hashtag to publish background information to the audience. 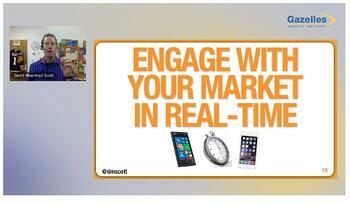 11) After the webinar concludes, jump in to the Twitter stream and respond to everyone no matter how long it takes. 12) Have participants ask questions via private chat to the webinar host and have the host queue up the questions and ask you them verbally. This approach means less fumbling at Q&A time. Here is a recording of a Webinar I led recently. Webinars can be a great way to communicate if you present knowing the limitations of the technology. Despite people assuming they will be boring, you have an opportunity to surprise and delight with your presentation skills. The most important thing to remember is that a Webinar doesn’t have the same emotional connection with your audience that an in-person meeting does and you need to compensate for that in all aspects of your presentation.